How much does it cost to travel to Stockholm? How much money will you need in Stockholm? kr1,433 ($154) is the average daily price for traveling in Stockholm. The average price of food for one day is kr301 ($32). The average price of a hotel for a couple is kr1,602 ($172). Additional pricing is in the table below. These average travel prices have been collected from other travelers to help you plan your own travel budget. How much money do I need for Stockholm? Stockholm is the capital city of Sweden and is made up of over 14 islands that are connected by countless bridges. Water is an integral part of the city, but so are parks and gardens. The city is covered in strategically positioned green space. Together, the water and parkland cover more than half of the city's area, giving this bustling city a breath of fresh air. Stockholm's temperature is not as cold as you might expect given the country's northern location. July and August are the wettest months and the summer temperatures hover around 20 to 25 degrees Celsius. The fall months are cooler and damp and the winter months, from December to March see temperatures around 3 degrees Celsius. Snow can happen between late November and early April. Spring is drier and temperatures hover around 9 degrees Celsius. Despite its cold climate, Stockholm makes excellent use of the outdoors. It's a city that makes you want to be outside. There is a modern cosmopolitan vibe, but also a wonderful old town that is enjoyable to explore. Stockholm is full of energy and vibrancy, and has a feeling of freshness. In addition to the natural beauty of Stockholm, there are plenty of sights and attractions that are worth visiting. These include the impressive building that is the City Hall, the Royal Palace and Drottningholm Palace, and the Skansen open air museum. Also be sure you allow yourself plenty of time to wander around the impressive old town area, Gamla Stan. This is the most compact and scenic part of the city. Stockholm is divided into a handful of districts, but you will find the majority of the attractions in "innerstaden", which is the inner city. The inner city itself is divided into three different sections. These divisions are created by waterways. The mainland area which includes Norrmalm, Vasastan and Ostermalm, is one district. Norrmalm is the central business district and it has many malls, museums, hotels and restaurants. It's also where you will find the central railway station. Vasastan is predominantly residential with some shopping and nightlife. Ostermalm has some tourist sights, upscale shopping, and a handful of museums. The islands of Gamla Stan and Sodermalm, are a second distrct. 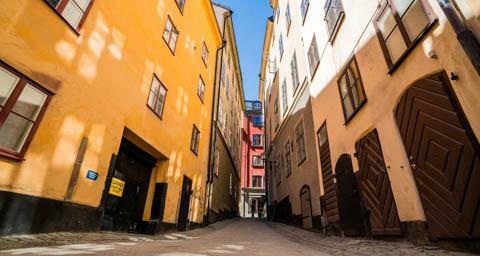 Gamla Stan is where you'll find the northern part of the Old Town and quaint cobblestone streets. Sodermalm has great views of the city, some restaurants, bars and shops. The third district is the island of Kungsholmen. Here there is a more suburban atmosphere with some shopping, restaurants and bars. Once you leave the inner city area, you'll find that Stockholm takes on more of a suburban vibe. There are many interesting tours available around Stockholm. In particular, boat tours can be a fun way to see the city. Other popular activities include sporting events such as soccer, ice hockey and skiing. Stockholm is notoriously an expensive place to eat out. There are many restaurants to choose from, most of which offer excellent food, but there are few options for those on a tight budget. In general, if you're hoping to save money, it's best to stick to the fast food bars, British style pubs, and some of the ethnic restaurants around town. Some Asian, Indian and Mexican restaurants offer all you can eat buffets at lunch that are not too expensive. It's also possible to pick up food at a supermarket and prepare your own meal. Also try and stay at a hotel or hostel that includes breakfast in the price of the room. Head to the suburbs for a cheaper meal as well, because the downtown area is usually more expensive. If you happen to be in town during the month of December, make sure you try the "julbord", or Christmas buffet that is available at many restaurants. This is a version of the traditional Swedish smorgasbord that includes traditional seasonal dishes like ham and pickled herring. There is a great public transit system that is probably the best way to travel around Stockholm. Biking is another alternative, and it gives you and opportunity to have a more hands on experience in the city and fully embrace the area's parks and wonderful fresh air. There are taxis available, but they are quite expensive and generally not worth it unless you find yourself stuck in the midst of winter when walking or waiting for a bus just doesn't seem appealing. Public transportation includes a subway, commuter train and bus system. There is also a light rail and ferry services. The metro is called the Tunnelbana and it has 100 stations that are spread throughout the downtown and most of the inner suburbs. It's a very extensive system and is one of the best ways to travel in the city.